Subaru is expanding its crossover lineup with the Ascent and Crosstrek Hybrid, but it hasn’t forgotten about the traditional cars that make up much of its cachet. To that end, Subaru has updated the WRX and STI for the 2019 model year, and base prices have gone up $225 and $525, respectively. For enthusiasts, the biggest news is that the WRX STI receives 5 more horsepower, bumping peak output from the tried and true turbocharged 2.5-liter flat-four to 310 hp. This improvement comes from a new air intake and high-flow performance exhaust as well as a retuned ECU and more robust pistons. Also, Subaru has revised the third gear ratio of the six-speed manual for quicker acceleration. The new model year brings updated infotainment systems for the WRX and STI lineup. The WRX’s standard 6.5-inch touchscreen now features Apple CarPlay and Android Auto. On the Premium trim, a new 7-inch touchscreen with Apple CarPlay and Android Auto is standard. Higher-trim WRX Limited models and STI models also feature upgraded infotainment systems with smartphone integration. Also new, all regular WRX models equipped with a CVT transmission come standard with EyeSight safety technologies. 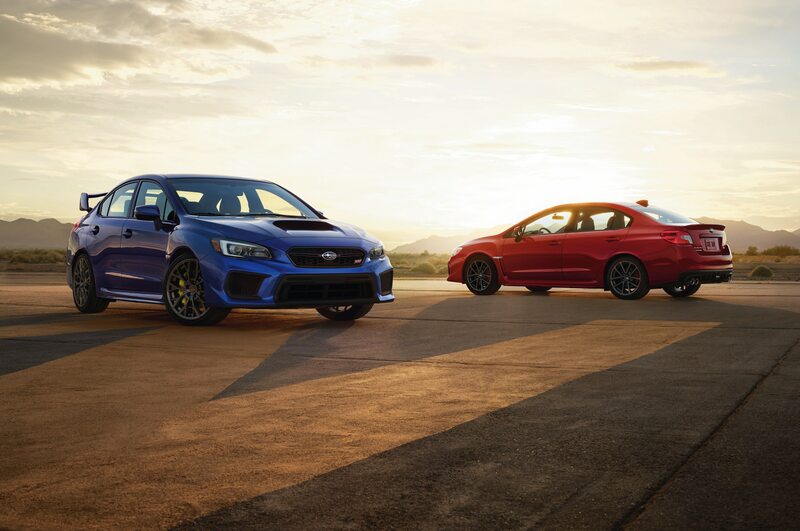 Subaru announced it will offer a limited-production version of the WRX and STI. Called the “Series.Gray,” the special models will come with black finished alloy wheels, a Cool Gray Khaki exterior, and Crystal Black Silica badges and folding exterior mirrors. WRX versions are based on the WRX Premium with the Performance Package including Recaro seats and other upgrades. For STI versions, buyers get a Bilstein STI sport-tuned suspension and silver-finish calipers for the Brembo brakes. Available only with the six-speed manual, Subaru will make 750 copies of this special trim for the WRX and 250 for the STI. Base WRX models go for $28,080 and come with a six-speed manual transmission. On the WRX Premium trim, expect to pay $30,380 with the manual or $32,280 with the CVT. Limited models feature LED steering responsive headlights, 10-way power driver seat, and other upgrades for $32,680 with the manual and $34,580 with the CVT. The STI starts at $37,480, and Limited models go for $42,280. Series.Gray models add $3,100 to the price of the vehicles they are based on. Expect these models to make their way to dealerships this summer. Confirmed: Subaru Is Bringing Hot WRX STI S209 to the U.S.
It’ll be the first “S” variant to make it to our shores.